I posted last year about my new model for Digital Leadership here at WGS and also presented about my plans at a local TeachMeet and at one of the TeachMeets at EduTech in June. the concept was to use badges as a way of recognising skills and contribution of students involved in the program - and as a model that would be intrinsic rather than extrinsic in its overall philosophy. I advertised for interested students, talked them through my plans while emphasising that my ideas were still in beta form. And it was very successful with over fifty students from Years 5 to 7 having some form of involvement. It was deliberately designed to be flexible and allow for students to buy in and commit to doing as much as they felt comfortable with. They played with and ironed out teething problems with some new robotics for me, ran lunchtime MinecraftEDU clubs for interested students and spent an afternoon every week with me looking to improve their digital skills. I had based it on the two areas of big interest around our school - Minecraft and robotics (mainly Spheros) - we then had digital leaders support teachers in their first foray into robotics which was great because student peer tutelage and troubleshooting allowed me to spend more time ensuring that the teacher's confidence levels in this area were on the right track. A core group of leaders volunteered to help with our senior special class experience MinecraftEDU for the first time and built some real bonds with the students within that class. It was amazing to see the leaders really show patience and interest in others, and see that extend into social connections out in the school yard as well. I had two leaders volunteer to be buddies for two at risk early years students, again using Minecraft as the medium, but being calm positive role models for these young students was the real achievement beyond any digital skills being honed. I did notice a few things about the sort of student who is interested in my program though. They generally are kids who enjoy being helpful but don't always have the self confidence to push themselves forward. They enjoy learning new things and having some status as an "expert" but rarely use that as a platform for showing off. I also noted that the Year 5 students were the keenest and most enthusiastic, but some were prone to see the Digital opportunities first and then become scarce when the leadership aspect was being emphasised. Year 7 students tended to dwindle to a handful as there seemed to be other leadership and community service opportunities available exclusively for their year level at our school competing for their attention. The Year 6 students were the most reliable and the ones who had joined the program for the leadership and helping aspect first with the digital playtime being a bonus second. I have also had a couple of students who come from very disadvantaged homes who gain a great sense of self belief and worth from being involved. So, when it came around to thinking about what changes would make the program better for this year, I invited eight of the most engaged 2015 Digital Leaders to a round table discussion to help me design this year's version. They were really helpful, and helped me iron out some of the kinks in my new plans. They even helped to conceptualise the new lanyards and create the idea of a Senior Lanyard to retain and recognise those students who were going to be involved for a second year. So, instead of eight different badges centered around Minecraft etc, I thought that I would separate the badges into Digital Badges and Leadership Badges so that the leadership aspect (working with classes, being a mentor or a buddy, running a lunchtime club, helping a new Leader become proficient) shared equal billing with the Digital side of things. I also wanted to broaden beyond Spheros and Minecraft and create expertise in a wider range of other Digital learning initiatives that are available or needed development at our school - things like Lego Stop Motion, Beebots and game creation. So throughout Term 1, the Friday afternoon time that I have has been dedicated to covering the Digital side of the ledger. We started with the familiar and ran Minecraft in the first few weeks, then Beebots and finally started on some Lego Stop Motion movies. Ninety minutes once a week goes pretty fast, and I had kids nominate what they were interested in and created a schedule with equal number of slots for boys and girls. I gave priority to kids who signed up for more options, and when I found our LittleBits kits in their hiding place, I found some kids who were ready to learn and become familiar with this technology and move on from Minecraft early. These kids were all new Year 5 Leaders and we quickly formed a Junior Inventors Club for them to run at lunchtimes catering for interested Early Years students. 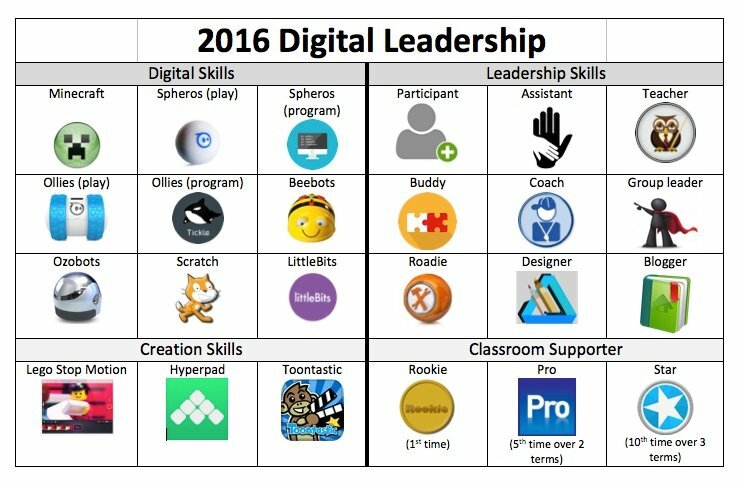 So, the plan is to continue offering time to use the Digital options on a Friday, but start to expand the Leaders' opportunities to earn their Leadership badges throughout the next term. The new lanyards have arrived and will be given out to all Term 1 participants who attended at least two sessions, with badges to be awarded as the year progresses. Teachers will then be able to seek the services of this group of Leaders as required - and this group of dedicated students will find an outlet for their unique talents. Posted in Digital Convergence, Leadership, Learning on May 14, 2016 by Graham.